This is an exciting opportunity for music majors! Two UMass Lowell music majors will be selected to participate in the Sarteano Chamber Choral Conducting workshop in Tuscany, Italy! Participation costs will be covered through a scholarship granted by the Sarteano workshop. Sing with choral musicians from all over the globe! Join Simon Carrington, Bronislawa Falinska and UMass Lowell Choral Director Brian O’Connell for their tenth consecutive year leading this workshop. 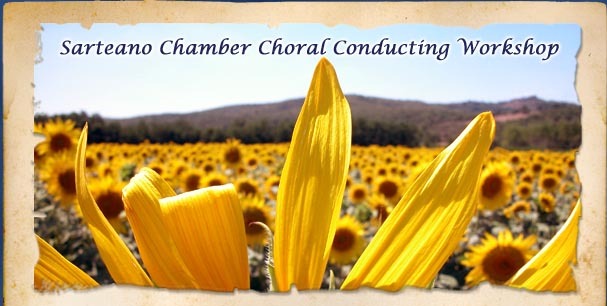 This intensive conducting workshop is geared for music educators and choral conductors with strong vocal ability who are interested in rehearsing and performing chamber choral music. You will be part of a 26-30-member ensemble that will prepare and perform a capella choral music from the 16th to the 20th century. As a music educator or conductor seeking the experience of working and learning in a small group, you will have the opportunity to establish and develop relationships and to make music with other like-minded musicians. Creating a cohesive and musical ensemble in such a short time period is essential to the workshop, and we will focus on techniques to help facilitate this over the course of the workshop. Workshop sessions will be held in the Società Filarmonica, and we will close with a performance in the beautiful Teatro di Sarteano. Learn more.